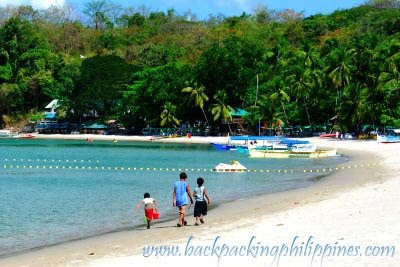 Sharing the long expanse of white sand beach with Terrazas de Punta Fuego in Nasugbu, Batangas, Munting Buhangin is a public beach resort unlike it's private (i.e. not open to the public) neighbor. Tutubi was able to capture photos of the beach when he visited Club Punta Fuego then a daytour of Terrazas de Punta Fuego. All Tutubi can say is that the beach front is really nice with fine white sand and not too crowded, with facilities for the family visible from a distance. Please visit Munting Buhangin Beach Camp's official website for inquiries, contact numbers, rates and other information. Driving directions to Munting Buhangin Beach Resort Nasugbu, Batangas: From SLEX, take Sta. Rosa exit all the way to Tagaytay and turn right after Tagaytay Public Market (and Tagaytay Econo Inn). Follow the highway, passing by Alfonso (Cavite) and until you reach kilometer marker 93, the so called Likuan, where you turn right (left turn leads to Balayan town). You will pass by Nasugbu town proper, Cawayan Cove, Tali Beach, Munting Buhangin and Terrazas de Punta Fuego. do they charge a fee if pitch my own tent? how's the security there may i ask? gud pm..what is the official website of munting buhangin beach camp? what is the exact place I will tell to the conductor of the bus..just nasugbu? or will it pass by straightly to munting buhangin? how much the entrance fee? and what is the cheapest room good for 15 persons for 2 nights and 3 days? tatagal ba ang pag - apruba? tanung ko po kng san po kame mag pa reserved po sa resort nyo po!!! 10 person po 2 nights 3 days po!!! hi how can i contact for booking ? magkano ang entrance and room rates? can we bring food to be cooked there? is there room or cottages with aircon? do you have swimming pools for adults and kids? will wait for your reply. rum rates nyo po mgkanu if for 15 to 20 persons? i am looking for the beach resort in Batangas which can occupy 450 persons. we are a group from AUP. Kung may alam po kayo kindly txt or call me at 639303608046 or email me at reiybanez@yahoo.com. Kahit hindi sa Batangas, basta somewhere in Region 4..
i was at munting buhangin 2 wks ago. mahal ang kuwarto. kulang sa linis especially c.r., dami construction, maalikabok, magulo, xe, dami renovation. ok ang dagat. nakakapagod umakyat panaog. ok ang staff. aga magsara ng store, nakakandado pa. mahal entrance kasi free breakfast daw. ubod naman ng tagal iserve.inshort, nids improvement. poor. sorry. san masarap magswimming na pang grupo ng kabataan? txt nio naman aq 09182365836, gusto naming magouting eh wala aq maisip n mapuntahan sa dami haha. salamat. kung kaya lng din ng budget puro kabataan kc. tenks! this is kinda confusing,, can u post some more pics and information about your resort!! kinda lack of information!! Sir may i have the details regarding the rates good for 10-12 pax room rates, cottage rates, entrance fees, and other rates for 3 days and 2 nights , the cheapest only , you can send me a mail through . in munting buhangin resort , panu ko po malalaman kung how much per head.. may contact number po ba kayo.? kung meron txt nio po ako PLEASE ASAP... 09082759025 hanapin nyo po si rhain ( ako yun ) salamat po NEED YOUR FEED BACK ASAP PLEASE..
1day lang for birthday celebration. good day po, ask ko lang po magkano po ba ang per head at ang rent ng cottage? pwede ba kami mag dala ng sarili nming foods and drinks? pls txt me at 09283523422. thank u po.